GOAL: To halt human-elephant conflict and poaching; to ensure that forest elephants can safely move within the greater forested landscape; to protect endangered primates, such as the chimpanzee and drill, in the sanctuary and surrounding forests; to garner support for conservation from local communities. The Banyang-Mbo Wildlife Sanctuary is a 667km2 protected area situated close to Korup National Park on the Nigeria-Cameroon border. It is part of the Lower Guinea forest region and support high biodiversity and species endemism. 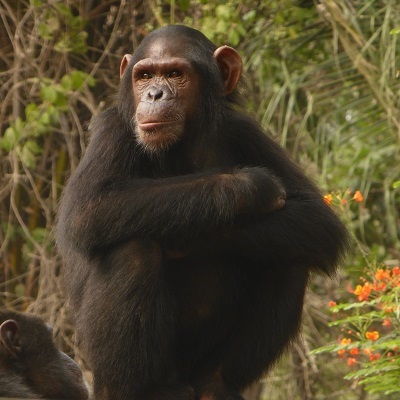 Primate diversity is particularly high and the region supports the endemic drill and the Nigeria-Cameroon chimpanzee, the rarest and most range-restricted subspecies of chimpanzee on the continent. Primates in the region are highly threatened by hunting. With a population decline of over 80% between 2002 and 2011, the forest elephants of West and Central Africa are also highly threatened. The situation in West Africa is particularly critical given high human population densities and high rates of forest fragmentation. Banyang-Mbo Wildlife Sanctuary, Korup National Park and other neighbouring forest blocks once supported a significant population of forest elephant but after several decades of intense ivory poaching, their numbers have declined. Born Free has been working at the sanctuary since 2016, conducting rapid reconnaissance surveys to garner something about the status of these important wildlife populations. Investigations of the abundance, distribution and threats facing the chimpanzee and the forest elephant continue. Data on the seasonal ranging patterns of forest elephant are being collected so that management decisions can be taken that will enhance their survival in the longer-term. Since 2017 and in collaboration with the Korup Rainforest Conservation Society (KRCS), the project has established an Elephant Guardian Programme in villages around the sanctuary. The aim of this project is to create an environment where elephants are tolerated and humans and elephants can co-exist together, so that elephant can move unimpeded through the landscape. 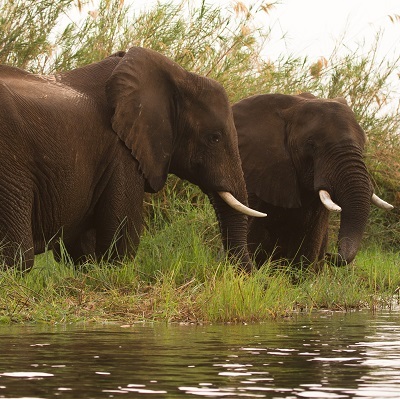 Although poaching pressure has markedly decreased in recent years, elephants are still vulnerable when they leave the sanctuary and are encountered in the vicinity of villages. 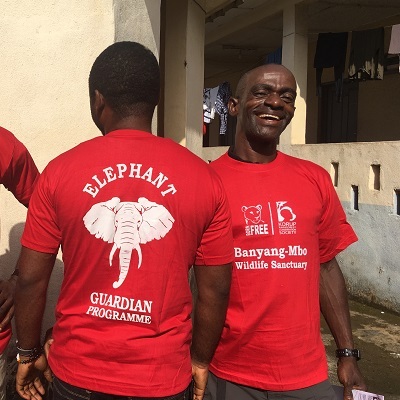 Local communities are encouraged to inform project staff rather than elephant poachers when they encounter elephants, so that project staff can monitor the movements of the elephants. In return the project is assisting village primary schools so that whole communities can benefit and wherever elephant crop foraging is a problem, build chili-fencing as a conflict mitigation strategy for local farmers.